Nota: Dat fiind situatiile cu care ne-am confruntat de-a lungul timpului, recomandam clientilor achizitionarea dronelor DJI numai de la magazinele autorizate DJI si numai cu factura in limba romana! Site-urile neautorizate DJI sau site-urile cu anunturi de mica publicitate nu ofera factura sau ofera facturi neautentice, pentru care producatorul DJI nu asigura garantie! De asemenea, conform noilor protocoale de securitate ale producatorului, achizitionarea unei drone furate sau de provenienta indoielnica poate duce la imposibilitatea activarii si deci a utilizarii acesteia. An uprated camera is equipped with a 1-inch 20-megapixel sensor capable of shooting 4K/60 fps video and Burst Mode stills at 14 fps. The FlightAutonomy system includes five vision sensors for 2-directional obstacle sensing and forward-vision obstacle avoidance. The adoption of titanium alloy and magnesium alloy increases the rigidity of the airframe and reduces weight, making the Phantom 4 Advanced even lighter than the Phantom 4. 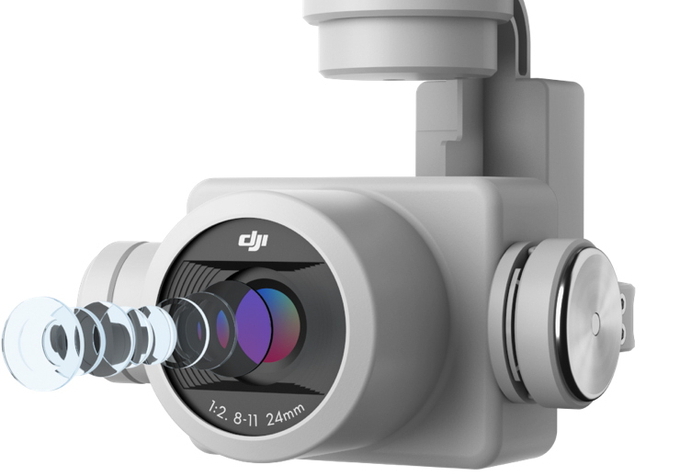 The onboard camera is equipped with a 1-inch 20-megapixel CMOS sensor. A mechanical shutter is used to eliminate rolling shutter distortion, which can occur when taking images of fast-moving subjects or when flying at high speeds. In effect, it is as powerful as many professional cameras. More powerful video processing supports H.264 4K videos at 60 fps or H.265 4K at 30 fps, both with a 100Mbps bitrate. Excellent optical performance, sensors, and processors ensure everything is captured with high dynamic range and more image detail needed for advanced post-production. images to be used immediately, while also capturing enough detail for advanced post-processing. An enhanced video processing system allows video to be captured in cinema and production optimized DCI 4K/60 (4096 x 2160/60 fps) at a bitrate of 100 Mbps, enabling you to get high-resolution slow motion shots. 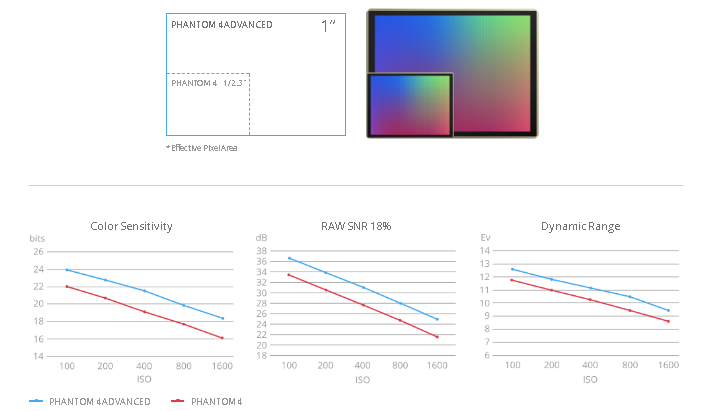 The Phantom 4 Advanced also supports the H.265 video codec (maximum resolution 4096X2160/30 fps). For a given bitrate, H.265 doubles the amount of image processing as H.264, resulting in significantly enhanced image quality. Recording in high dynamic range D-log makes the most of image data for color grading. The resolution and contrast of a lens is critical to image quality, because only a quality lens can capture sharp, vivid photos at high resolutions. 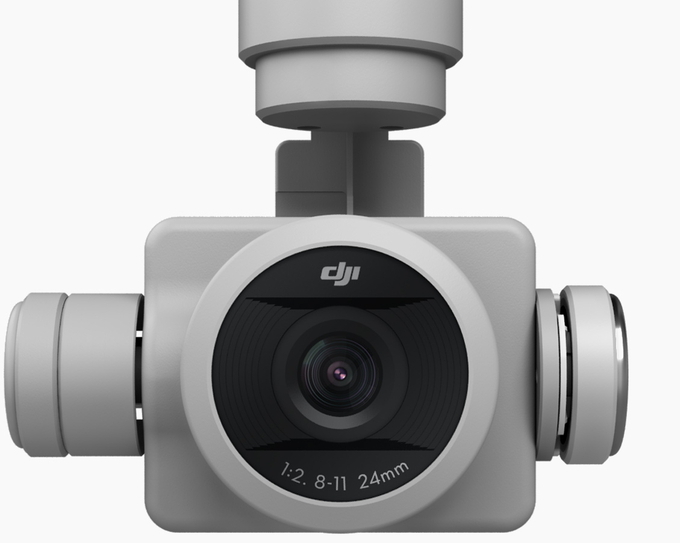 The brand new Phantom 4 Advanced camera has an aerial optimized F2.8 wide-angle lens with a 24 mm equivalent focal length. It features eight elements – two aspherical – arranged in seven groups that fit into a smaller, more compact frame. Its images are consistently detailed with low distortion and dispersion, ensuring that photos and videos are sharp and vivid. capturing objects moving at high speeds has always been a challenge for flying cameras using electronic shutters. 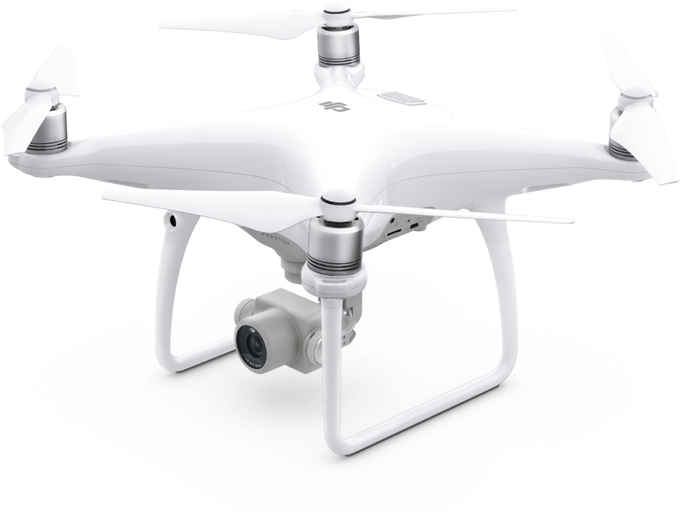 The Phantom 4 Advanced uses a mechanical shutter and a large-aperture prime lens. A mechanical shutter with a maximum speed of 1/2000s eliminates rolling shutter distortion which can occur when taking images of fast moving subjects, or when flying at high speeds. The electronic shutter has also been improved with a maximum shutter speed of 1/8000s. A new Burst Mode is capable of shooting 14 fps at 20-megapixels, all for catching the perfect moment. and redundant sensors, the Phantom 4 Advanced can hover precisely in places without GPS and navigate complex environments. The dual forward vision sensors can see as far as 30 m out in front, enable auto brake, and hover or detour in front of obstacles within a 15-meter range. 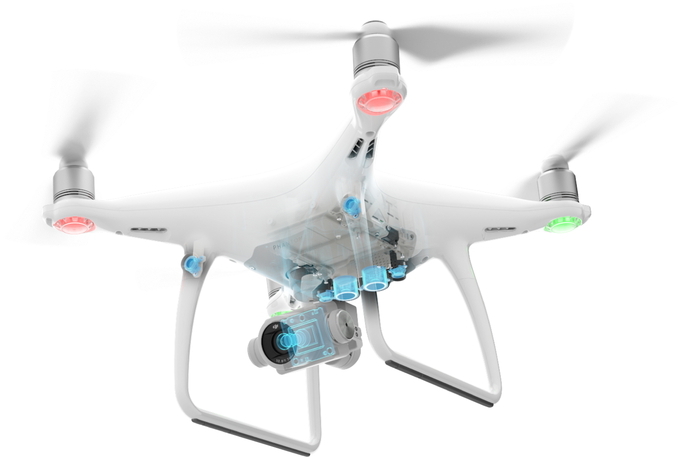 The Phantom 4 Advanced+ comes equipped with the upgraded Lightbridge HD video transmission system, which has a maximum video transmission range of 4.3 mi (7 km). * A 5.5-inch 1080p screen integrated with the Phantom 4 Advanced+ offers 1000 cd/m2 of brightness, more than twice as bright as conventional smart devices, enabling clear visibility in direct sunlight. 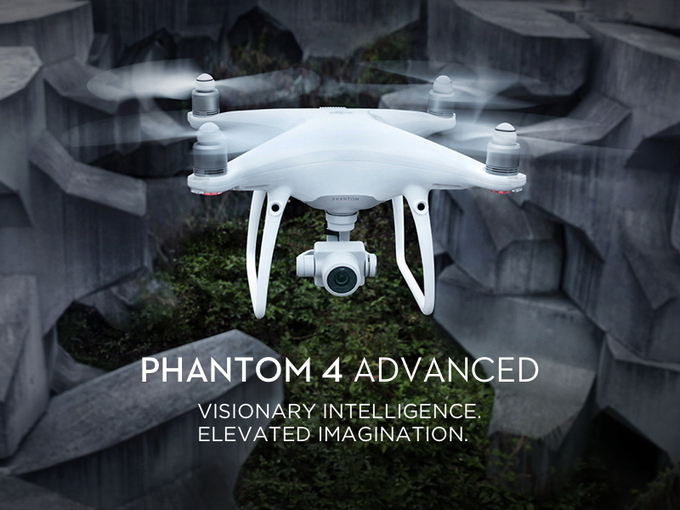 With a five-hour battery life, the Phantom 4 Advanced+ is a powerful aerial imaging solution. The built-in DJI GO 4 app allows you to live stream, edit, and share your aerial videos and photos instantly. Acest echipament este asimilat aeronavelor civile iar utilizarea lui in spatiul aerian national este conditionata de respectarea unor acte normative specifice (Codul Aerian, art. 3.7 si 3.8, Sectiunea II "Termeni si definitii", Remotely Piloted Aircraft Systems (RPAS sau "drone"). Conform legii, acest echipament de zbor trebuie identificat la Autoritatea Aeronautica Civila Romana (AACR). Zborul fara identificare la AACR a dronei atrage raspunderea penala a operatorului acestuia. Zborul neautorizat (fara segregare de spatiu aerian sau anuntat COAP, dupa caz) se sanctioneaza cu amenda de la 20.000 lei la 35.000 lei. Identificati acest aparat la AACR. Informatii pe www.caa.ro - "Ghid pentru operarea aeronavelor civile fara pilot la bord"); +40 21 208 15 08; email: dir.gen@caa.ro.